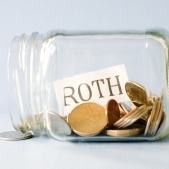 The Roth 401(k) is 10 years old! With 62 percent of employers now offering this option, it’s more likely than not that you can make Roth contributions to your 401(k) plan. Are you taking advantage of this opportunity? A Roth 401(k) plan is simply a traditional 401(k) plan that permits contributions to a designated Roth account within the plan. Roth 401(k) contributions are made on an after-tax basis, just like Roth IRA contributions. This means there’s no up-front tax benefit, but if certain conditions are met both your contributions and any accumulated investment earnings on those contributions are free of federal income tax when distributed from the plan. Anyone! If you’re eligible to participate in a 401(k) plan with a Roth option, you can make Roth 401(k) contributions. Although you cannot contribute to a Roth IRA if you earn more than a specific dollar amount, there are no such income limits for a Roth 401(k). The five-year holding period starts with the year you make your first Roth contribution to your employer’s 401(k) plan. For example, if you make your first Roth contribution to the plan in December 2016, then the first year of your five-year holding period is 2016, and your waiting period ends on Dec. 31, 2020. Special rules apply if you transfer your Roth dollars over to a new employer’s 401(k) plan. There’s an overall cap on your combined pretax and Roth 401(k) contributions. In 2016, you can contribute up to $18,000 ($24,000 if you are age 50 or older) to a 401(k) plan. You can split your contribution between Roth and pretax contributions any way you wish. For example, you can make $10,000 of Roth contributions and $8,000 of pretax contributions. It’s totally up to you. While employers don’t have to contribute to 401(k) plans, many will match all or part of your contributions. Your employer can match your Roth contributions, your pretax contributions, or both. But your employer’s contributions are always made on a pretax basis, even if they match your Roth contributions. In other words, your employer’s contributions, and any investment earnings on those contributions, will be taxed when you receive a distribution of those dollars from the plan. Yes! If your plan permits, you can convert any portion of your 401(k) plan account (your pretax contributions, vested employer contributions, and investment earnings) to your Roth account. The amount you convert is subject to federal income tax in the year of the conversion (except for any after-tax contributions you’ve made), but qualified distributions from your Roth account will be entirely income tax free. The 10 percent early-distribution penalty generally doesn’t apply to amounts you convert. Like pretax 401(k) contributions, your Roth contributions can be distributed only after you terminate employment, reach age 59½, incur a hardship, become disabled, or die. Also, unlike Roth IRAs, you must generally begin taking distributions from a Roth 401(k) plan after you reach age 70½ (or, in some cases, after you retire). But this isn’t as significant as it might seem, because you can generally roll over your Roth 401(k) money to a Roth IRA if you don’t need or want the lifetime distributions.